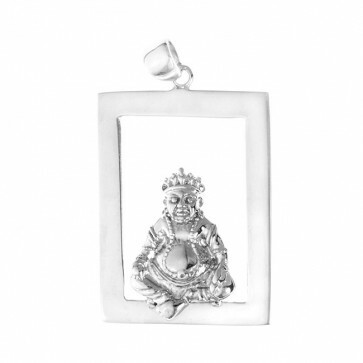 Embrace the wealth-attracting energies of Buddha Dzambala, who brings material prosperity, spiritual wealth and helps overcome financial challenges. A powerful wealth Buddha, Dzambala's practice also brings us spiritual wealth and helps us overcome emotional poverty: miserliness, greed and the inability to give or share. Bring Dzambala's wealth energy and blessings everywhere you go with this exclusive, beautifully designed pendant of Dzambala mounted on a hollow rectangular frame, in 925 sterling silver plated with 18K white gold. Embrace the wealth-attracting energies of Dzambala, who brings material prosperity, spiritual wealth and helps overcome financial challenges. A powerful wealth Buddha, Dzambala's practice also brings us spiritual wealth and helps us overcome emotional poverty: miserliness, greed and the inability to give or share.